Retired U.S. 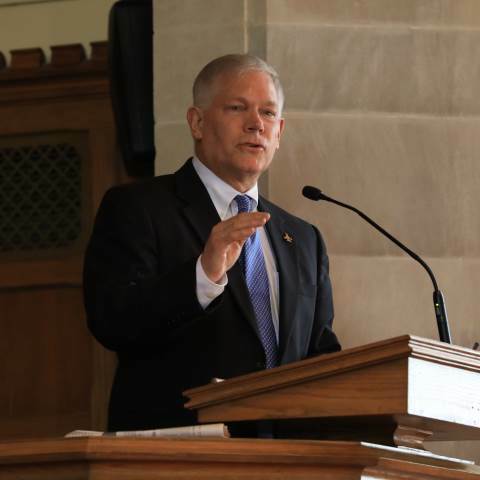 Congressman Pete Sessions was the 16th speaker in the annual Class of 1953 Lectureship Series on Thursday, April 11. Sessions represented the people of north Texas for 22 years and now runs a Dallas-based consulting and public affairs company, Sessions LLC. He was first elected to the U.S. House of Representatives in 1997 and served 11 consecutive terms. From 2013-2019, he served as the chairman of the House Rules Committee, which is responsible for establishing the terms and conditions of debate on the floor of the U.S. House of Representatives. This included determining the amendments, if any, that were determined to be in order for final vote on legislation. In 2008 and again in 2010, Sessions was elected by the House Republican Conference as chairman of the National Republican Congressional Committee. Click here to read more about Sessions. The Class of 1953 Lectureship Series was established in 2003 to commemorate the class’s 50th reunion. The Lectureship Series brings to campus visiting lecturers who inspire and stimulate students to expand their thinking.